• Keyframe: A keyframe is a point in time where a change to the properties of the object or character occurs. 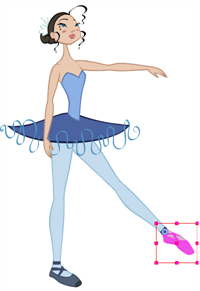 In Harmony, keyframes consist of the coordinates that determine how an entire layer and its contents are moved. Keyframes include these parameters: XYZ position, skew, scale, angle and pivot. • Exposure: Exposure is a property; it is the length of time that a drawing is visible over a series of frames. In Harmony, exposure is independent of keyframes. That is, keyframes are not linked to drawings. 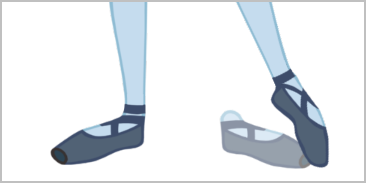 Keyframes can be moved independently from the drawing exposure. • Key Exposure: A key exposure in Harmony is a type of exposure that forces a drawing to remain exposed on a specific frame. If a drawing is exposed before a key exposure and you swap out that drawing for another one, then the original drawing is retained. This preserves the key drawing. Note that Harmony automatically sets a key exposure when you perform a drawing swap. NOTE: Keep in mind that when you swap a drawing, its entire exposure is replaced up to the next drawing exposure. When selecting a certain frame range to be swapped, the behaviour of the Timeline and Library views is different. If you are using the Parameters area of the Timeline view to select a drawing to replace a selected frame range, the new drawing will replace the frame range and continue until the next key exposure. In the following example, drawing 2 (DR2) is replaced by a new drawing, starting at the beginning of the selected frame range and ending at the next key exposure. If you use the Drawing Substitution window in the Library view to select a drawing, the drawing is split in two and the exposure before and after the frame range remain the same. In the following example, drawing 2 (DR 2) is split in two and the selected frame range is filled with a new drawing. In the Timeline view’s right side, select the cell containing the drawing or symbol cell to swap. In the Drawing Substitution field, position the pointer over the value and drag left or right to change the cell or drawing exposed for another one. You can also type in the drawing name or symbol’s cell number if you know it. In the Transform Tool Properties view, make sure the Peg Selection button is deselected. 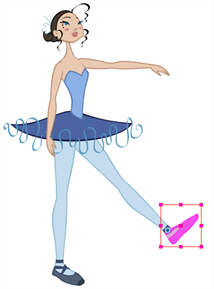 In the Camera view, use the Transform tool to select a part of the drawing to swap. NOTE: You can swap the frames in symbols or the drawings in a layer. However, you cannot swap one symbol for another. In the Timeline view, select the cell range in which you want to swap the drawing. 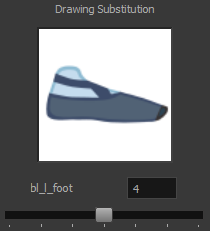 In the Library view, go to the Drawing Substitution window. 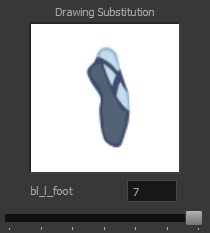 ‣ From the top menu, select Animation > Substitute Drawing Previous or Substitute Drawing Next. ‣ Drag the slider left or right. The drawing or symbol’s cell on the current frame is replaced. NOTE: Keep in mind that if you modify the artwork in a drawing, all instances of that drawing will be automatically updated even if set as a key exposure. This keeps your existing animation key poses intact. It is frequently used on a mouth or eyes layer. When you no know longer need a key exposure, you can remove it. When you do this, the existing key exposure is replaced by the preceding exposure. In the following example, a key exposure is set to drawing 1 (DR 1). When the key exposure is removed, the exposure is replaced by the preceding exposure, drawing 4 (DR 4). In the Timeline view, select a key exposure to remove. ‣ In the Timeline toolbar, click the Remove Key Exposure button. ‣ In the Timeline menu, select Exposure > Remove Key Exposure. ‣ Right-click and select Exposure > Remove Key Exposure. The key exposure is removed and replaced by the preceding exposure.